Last night, I saw John Cleese here in Halifax. And that reminded me, in a round about way, of my first job. 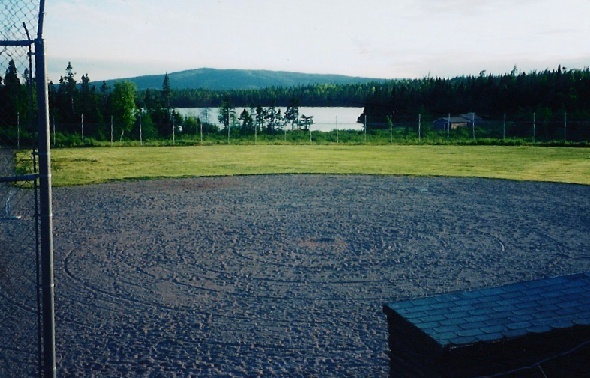 In the summer of 1982, the year I graduated high school (last graduating Grade 11 class before grade 12 was introduced) the Random Lions Club got a grant to develop a park at Elliott’s Cove Pond. They proceeded to have a summer job program for some students, and one supervisor. I put my name on the list which if I remember correctly was by filling out a form at manpower, and was lucky enough to get chosen. After all these years I forget who else worked there that summer, but I do remember Merril Rogers was our supervisor/co-worker, and that both Rob and Derek Burt worked there as well. At the time, where the park is now was nothing but woods, we worked hard that summer, clearing land with chain saws, sometimes in oilskins in the pouring rain. Wheeling wheelbarrow loads of crushed stone to make paths, chopping up roots, hauling stumps, making bridges, etc. But by the time the summer was over, a lot of the core park area was ready to be developed more. One regret that I have is that from my first paycheque, which Dad cashed for me at the bank while I was working, he got me a silver dollar to have as a keepsake from it. I had it for many many years, until my move to Nova Scotia where at some point it was forgotten or mislaid. Hoping sometime I can find it. How does John Cleese enter into this? Well one of my most vivid memories of the summer was myself and Rob Burt, on the beach near the brook, reciting scenes from Monty Python and the Holy Grail as we ate our lunch. Hard work, and still a lot of fun. And we started a park that while maybe nothing spectacular has had lots and lots of use since, and am proud. Hope you find the dollar–that was very thoughtful of your Dad.